The Global Volcanism Program has no activity reports for Yucamane. The Global Volcanism Program has no Weekly Reports available for Yucamane. The Global Volcanism Program has no Bulletin Reports available for Yucamane. Volcán Yucamane lies at the south end of a group of three volcanoes known as the Caliente-Yucamane Volcanic Complex; both it and Cerro Caliente to the north display evidence of postglacial lava flows, which overlie thick moraines. The andesitic Yucamane has a youthful, well-preserved summit crater. Late-Pleistocene and Holocene eruptions have produced airfall deposits, pyroclastic flows and surges, and block-and-ash flows produced by growth and collapse of lava domes. The most recent confirmed eruption, a subplinian event, took place about 3000-3300 radiocarbon years ago. Historical eruptions originally attributed to the more dissected Tutupaca during the 18th-20th centuries (Catalog of Active Volcanoes of the World) were considered by de Silva and Francis (1990) to have more likely been from Yucamane, but later authors (eg. Samaniego et al. 2015) assigned them to Tutupaca, including an eruption of uncertain character reported in 1787 (Volcanological Society of Japan, 1971). Ongoing fieldwork has not found deposits younger than the 3000 BP event (Samaniego, 2015). Rivera M, Marino J, 2006. Volcanic hazards evaluation of Yucamane volcano, southern Peru. Cities on Volcanoes 4, Quito, Ecuador, 23-27 Jan, 2006, Abs, p 71. Samaniego P, 2015. Email with additional thoughts about Tutupaca and Yucamane eruptions.. pers comm. There is no Deformation History data available for Yucamane. There is no Emissions History data available for Yucamane. 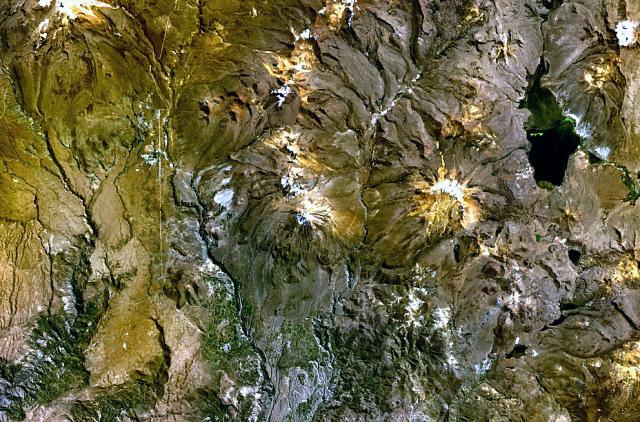 Volcán Yucamane (center) lies at the south end of a group of three volcanoes between the Río Callazas (left-center) and Río de Calientes (right-center). Laguna de Vilacota (upper right) lies east of the volcano. Both Yucamane and Cerro Caliente, the edifice immediately to the north, display evidence of postglacial lava flows. The andesitic Yucamane volcano has a youthful, well-preserved summit crater, and the volcano may have had historical eruptions. There are no samples for Yucamane in the Smithsonian's NMNH Department of Mineral Sciences Rock and Ore collection. Large Eruptions of Yucamane Information about large Quaternary eruptions (VEI >= 4) is cataloged in the Large Magnitude Explosive Volcanic Eruptions (LaMEVE) database of the Volcano Global Risk Identification and Analysis Project (VOGRIPA).